Sorry... the 2017 BMW X3 is no longer being sold as new. Instead, take the first step to a great deal on 2019 BMW X3 with a free price quote! 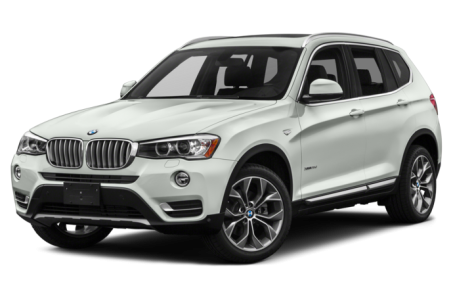 The 2017 BMW X3 is a compact luxury SUV that seats up to 5 passengers across two rows. It sits between the X1 and X5 in the lineup. It offers a sporty driving experience with its high performance engine options and stiff suspension. It competes with the Audi Q5, Mercedes GLC-Class, and Lexus RX 350. Four trims are available: the sDrive28i, xDrive28i, xDrive28d, and xDrive35i. Overall, the X3 has a lean, rugged appearance. The hood and body feature sharp creases. The skid plate and wheel wells are clad in black. The front-end of the X3 is distinguished by its outstretch headlights, which join the trademark dual-kidney front grille. Standard features include Xenon HID headlights, LED fog lights, power/heated side mirrors, and a power liftgate. An available M Sport aerodynamic kit makes the X3 appear more aggressive. Other optional features include adaptive LED headlights, a panoramic moonroof, and adaptive suspension. Powering the X3 is a standard 240-hp, twin-turbocharged 2.0-liter 4-cylinder engine mated to an 8-speed automatic transmission with sport and manual shift modes and rear-wheel drive (RWD) or all-wheel drive (AWD). A 180-hp, turbo-diesel 2.0-liter 4-cylinder and a 300-hp, twin-turbocharged 3.0-liter 6-cylinder are also available. Fuel efficiency for the 4-cylinder/RWD model is an EPA-estimated 21/28 mpg city/highway. With the 6-cylinder/AWD configuration, it drops to a 19/26 mpg rating. Inside, the X3 features an upscale interior with a various selection of colors. It has a maximum 63.3 cubic feet of rear cargo space. A power adjustable seat, a 40/20/40 split-folding rear seat, automatic climate control, Bluetooth connectivity for phone and audio, and adaptive cruise control come standard. The available M Sport package includes sport seats and an M Sport steering wheel. Other optional features include full leather upholstery, heated front and rear seats, heated steering wheel, a heads up display, an integrated navigation system, a wireless charging station, and a Harmon Kardon premium audio system. Standard safety features include forward collision warning, lane departure warning, park distance control, and a backup camera. Available features include surround view, a blind spot monitoring system, a parking assistant, and remote emergency services. 32 of 32 (100%) consumers said they would recommend this vehicle to a friend.